First: A little business. The blog is going whack. We are having some domain issues and I am having some brain issues as I try to work it out. Bear with me please. If you try to use nodesperatehausfrau.com you will get redirected to a GoDaddy ad. I changed the domain to notsodesperatehausfrau.com since I can't seem to reclaim the old domain. If you follow on a feed like Bloglovin be sure to follow it under the new domain. Sorry for the mess and confusion!!! Now, on to the fun stuff. We are full-on in the "In & Out" Stage, meaning, Eli loves to put things in anything with a space to put things in and take things out of anything with things to take out. Not the best sentence there but you get the idea. 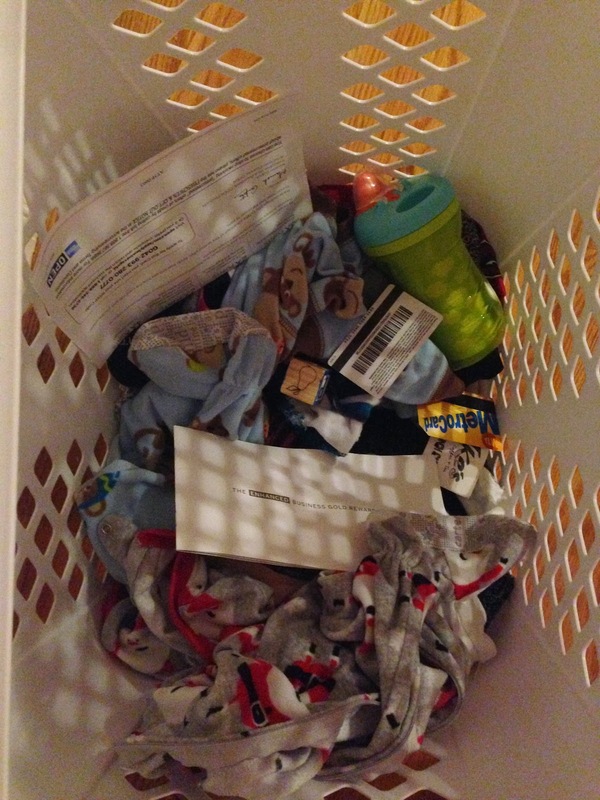 He has progressed from taking all of the clothes out of every drawer within his reach to taking the (clean) clothes out of his drawer and putting them in the dirty clothes hamper to now just taking whatever he can find and putting it in the laundry basket. While he's a little mixed up on what exactly belongs in the hamper, he has figured out that clothes belong in drawers. Kitchen drawer, oven drawer, dresser drawer, it's all the same to him. I'm just glad he's willing to help put clothes away! 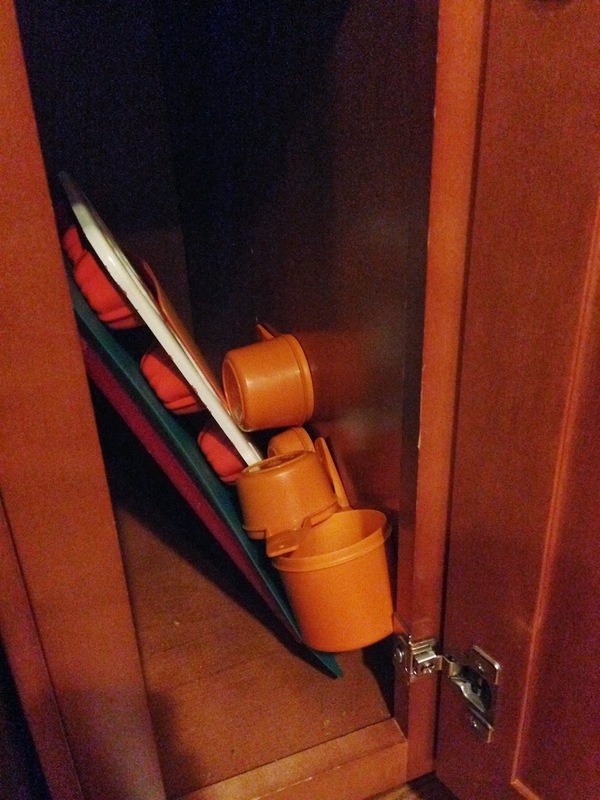 He rearranges my cabinets almost daily and loves to surprise me with new ideas on how he thinks I should store my cutting boards, muffin tins and measuring cups. 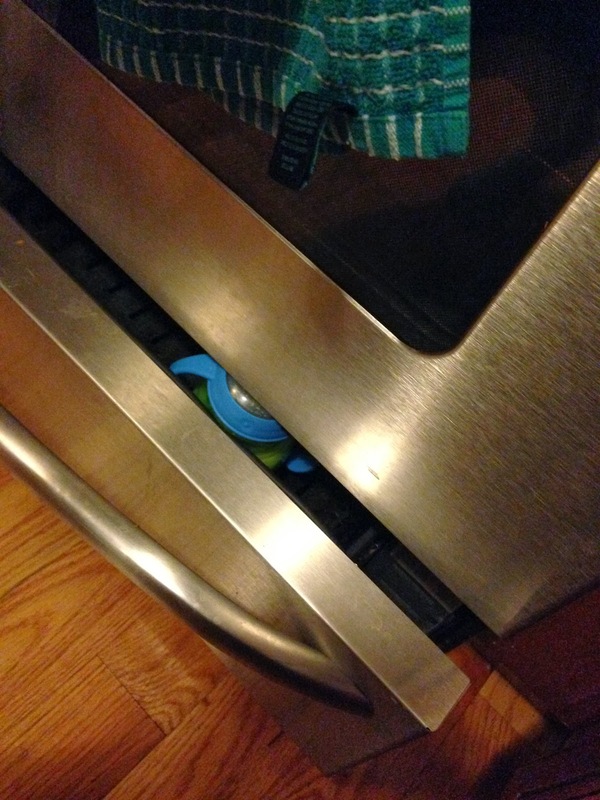 I have found socks, pants and sippy cups nestled in with cookie sheets and baking pans. 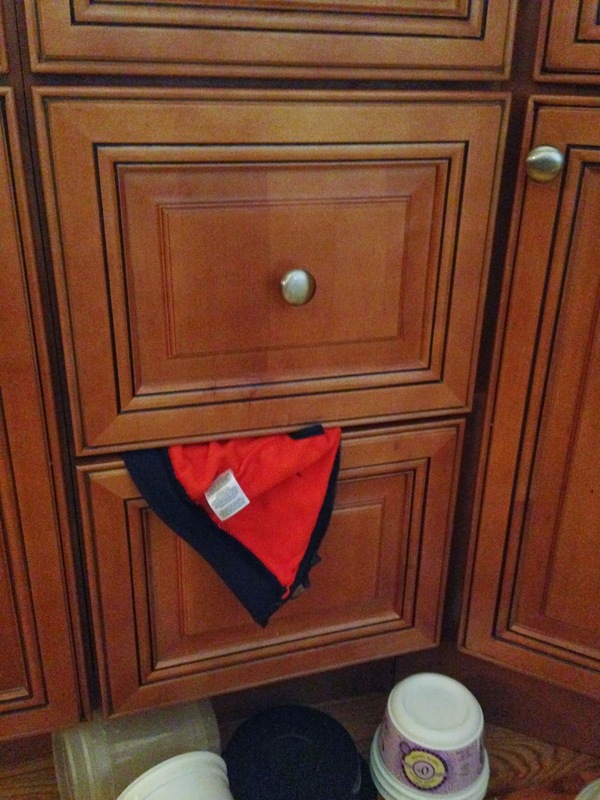 If anything goes missing, we have pretty much narrowed it down to 3 locations that it could be: one of the kitchen cabinets/drawers, the laundry basket, or the drawer underneath the oven. His methods are a bit unconventional, but I appreciate his thinking outside of the box and his attempts to help put things away. Lately, however, he has discovered some not-so-safe spaces to put things. We have retrieved a bottle of hand-sanitzer and credit cards from the recycling and have made it a habit to do a quick check before taking it out. We are pretty sure he threw away my in-laws dog bowl and TV remote while we were there for Christmas. Thorough investigations have yet to turn either missing item up and given the fact that our own trash can gets placed on the other side of the baby gate (his hands have been caught hovering over it more than once) it is the only logical conclusion as to what their fate might have been. By now you're probably surprised I haven't mentioned the toilet. Ohhhhh the toilet. We have not had any mishaps...yet! I saved a hairbrush this morning at the last minute and will now keep a close eye on little man and the toilet seat. I have a feeling this is only the start of the mischief that boy will get into!